KIEV, Ukraine -- Leaders of the European Union and Ukraine made little headway Monday in easing strains between them, despite common ground in opposing Russia’s intervention in the east of the country. Ukrainian President Petro Poroshenko, right, speaks with European Commission President Jean-Claude Juncker, center, and European Council President Donald Tusk, left, in Kiev on Monday. European Union’s Tusk doesn’t foresee a peacekeeping mission, while Poroshenko defends pace of domestic reforms. After their first formal summit since Russia annexed Crimea in eastern Ukraine a year ago, the EU played down prospects for a peacekeeping operation here, while Ukrainian President Petro Poroshenko defended the pace of his government’s economic overhauls and anticorruption drive. European Council President Donald Tusk said the bloc would soon send a team to assess “the needs and possibilities” for an EU mission. However, any such operation must be purely civilian, he said, warning that a military component was currently impossible. Since the signing of a fragile cease-fire agreement in the Belarus city of Minsk on Feb. 12 between Kiev and Russian-backed rebels in the country’s east, Ukraine has been urging the EU and other Western countries to form a mission to bolster the peace process. EU officials have said they could envisage some kind of border advisory mission. The bloc already has one operation advising the Ukrainians on judicial and security changes. However, they note that the Minsk accord handed the role of monitoring the cease-fire to the Organization for Security and Cooperation in Europe, a group that include Russia and Ukraine as members. “We know the expectations of the Ukrainian side on the issues,” Mr. Tusk said. European officials were focused on pushing Ukraine to fix its ailing economy. EU officials acknowledged Ukraine has advanced a number of initiatives in recent weeks, including appointing the head of an anticorruption task force, giving local governments more control over budgets and other powers, and liberalizing the energy sector. But they said much more needs doing. Mr. Poroshenko bristled at suggestions his administration was too slow. “In current conditions we just ask for one thing: fair assessment of Ukraine’s team actions,” he said at a news conference. A year into a grinding standoff with Russia over Ukraine, EU and Ukrainian diplomats have acknowledged a widening set of differences. Moscow has reveled in the strains. Monday’s summit came against the backdrop of fresh fighting. Violence had subsided across most of the front line. But OSCE monitors reported late Sunday they had witnessed some of the heaviest shelling since February around Shyrokyne, a town on the outskirts of Mariupol, the largest city in the region still under Kiev’s control. The OSCE mission reported 69 shots fired from tanks, as well as hundreds of mortar rounds fired. Heavy incoming artillery fire from separatist lines landed about 300 meters (330 yards) from the OSCE monitoring post, forcing the monitors to relocate. The OSCE said it saw rebel tanks and other armored vehicles massing in the area. The EU and Kiev sounded a joint note on the violence. There was also agreement Monday on fully implementing a trade agreement by January. Russia has fiercely opposed the pact, which it says would harm its economic ties to Ukraine. In September, the EU allowed Ukraine to delay enacting key parts of the accord. Mr. Juncker also announced €70 million ($76 million) of additional assistance as part of a long-standing program to clean up the area around the Chernobyl nuclear site. And Mr. Poroshenko thanked the EU for agreeing to a new €1.8 billion balance of payments loan. The EU said it hoped the first tranche of that would be paid in the summer. Mr. Poroshenko also renewed his call for the EU to consider Ukraine for eventual membership. Asked to respond, Mr. Juncker said the question of a Ukrainian membership bid wouldn’t be on the table for the foreseeable future. Meanwhile, Mr. Poroshenko’s call for quick progress on visa-free travel for Ukrainians to the EU appeared to receive short thrift. Ukrainian diplomats say the EU is blocking progress because of concerns that Russia’s control of Ukraine’s eastern borders would produce a wave of uncontrolled migration. Brussels says Kiev hasn’t done its homework. 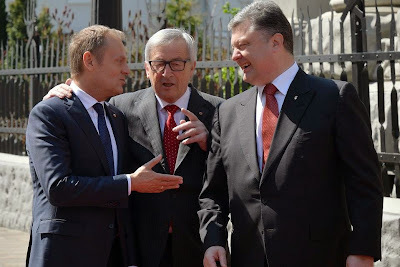 A senior EU official said Mr. Juncker handed Mr. Poroshenko a one-page summary of tasks Kiev must implement for the talks to succeed. They include completing the rollout of biometric passports, measures to strengthen border security and steps to prevent and fight organized crime and money laundering.